I’ve been enjoying picking up my ripple again, it’s been a while since it had any attention. I’ve got 3 new crochet mags (see here) and I think they might have kick started my crojo, as I hoped. I’ve got one of those really annoying Summer viruses where it completely knocks the stuffing out of you. You expect them in the Winter and embrace soup, duvet days and crappy tv, but not when the sun shines. But an upside is wanting to do nothing more demanding than crochet a few rows of ripple. Crochet and Glastonbury highlights are helping. I’m listening and sort of watching Adele as I type this, she’s good – of course she’s good, it’s Adele – but Coldplay were amazing. Bookwise this week my custard brain just needs something easy and soothing; so I’ve been listening to A Breath of French Air, the second of the Pop Larkin series by H.E Bates. I really enjoyed listening to The Darling Buds of May recently, it has been years since I first read it. Philip Franks played Charlie in the tv series and he does a surprisingly good job of narrating, even the female characters. It’s one of several books I’ve got on the go, along with short stories and a couple of non-fiction books. I’m joining in with Ginny’s Yarn Along once again. I really enjoy seeing what else others are reading, as much as what they’re making. Maybe even more. I can’t remember a time when I haven’t read. Your afghan is looking great. I love watching the colors change. 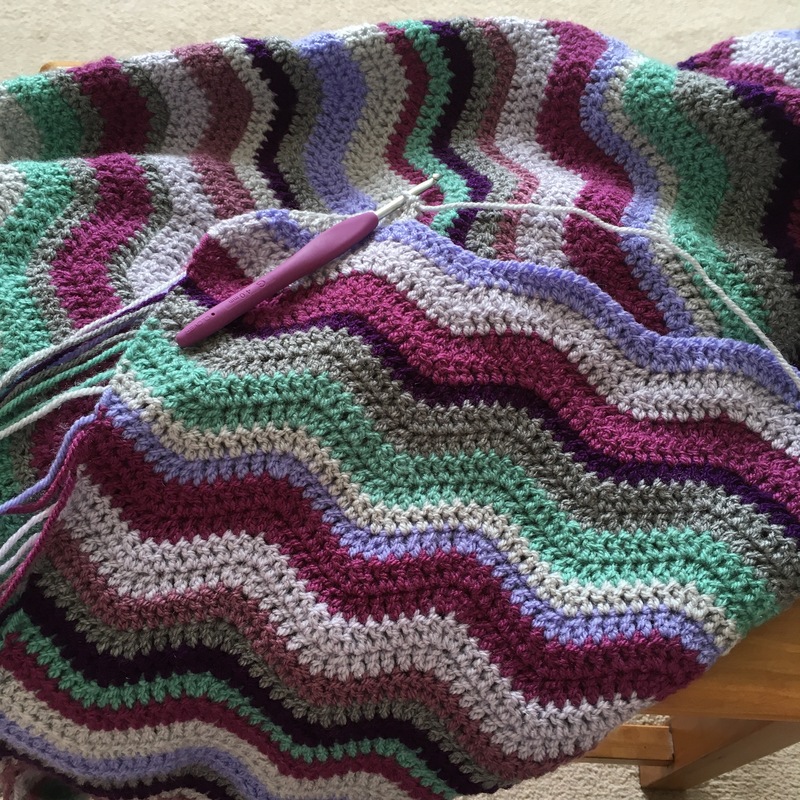 The colors in your ripple blanket are wonderful together. Hopefully you’ll knock down the virus soon and can thoroughly enjoy the return of your crojo. aw hope you feel better soon. I agree Summer colds feel very unfair and wrong lol. I’ve not heard “crojo” before, I like it! I loved reading The Darling Buds of May. I’ll have to have a reread now. Got to love a good ripple too. Fab colours!